The transition to low carbon housing is walking the path of research to reality – a route where industry leaders and experts agree should be collaborative to fast-track its integration into the Australian housing sector landscape. Recently at a national housing forum organised by the CRC for Low Carbon Living, the Australian Sustainable Built Environment Council and the University of South Australia, there was unanimous agreement by representatives of the housing sector, industry, government and research who attended, that urgent and significant action should be taken to reduce carbon emissions in this area. The forum, which is part of a CRCLCL series on low carbon issues being held over the next few months, was designed to bring industry groups together to explore opportunities to improve the energy productivity of the residential sector and move forward on a plan facilitating the transition to a low carbon economy. One of the key points expressed on many occasions during the day was that Australia lags behind much of the developed world on addressing the environmental impact of our homes, and this has to change. To address this dilemma, there was support among forum attendees for a significant increase in the minimum energy standards required for new homes, the disclosure of energy performance on sale of existing homes and incentives to be provided to fast-track the upgrade of our housing stock. But of course the journey is not without its hurdles – such as the need to change legislation and building codes while selling low carbon housing to the general public. Discussions touched upon the reality that energy savings alone were not enough to encourage consumers to choose low carbon housing. So this was marked as a challenge to be met – how to package the product. On this point, South Australian climate change minister Ian Hunter said it was important to bring the community along on the journey. He underlined the fact that we need to give credit to the intelligence of the general public in recognising the benefits and opportunities that come with a low carbon economy while voicing the government’s aspiration of making Adelaide Australia’s first carbon neutral city. Also speaking on the issue of community engagement were research leaders Professor Wasim Saman (CRCLCL research leader, integrated building systems) and Dr Stephen White (CRCLCL program leader, engaged communities). They pointed to research evidence that showed that irrespective of consumer attitudes to the environment, people resonated strongly with the features or qualities of low carbon homes, but that accurate and reliable information was needed to cut through the greenwash and empower consumers. Research also shows that the experience of low carbon homes is very positive to residents – they deliver real and significant energy and carbon savings while presenting better economic outcomes to owners and the greater community. One key player in Australia’s low carbon housing future is ASBEC. Its president, Professor Ken Maher, spoke about the unique collaboration that was required to produce two key reports recently published called Low Carbon, High Performance: How buildings can make a major contribution to Australia’s emissions and productivity goals and the National Framework for Residential Rating. These reports reveal how high performing buildings can provide a cost-effective and quality-of-life-enhancing solution to Australia’s emissions reduction commitments. It was enlightening to hear how these reports came about and how we need a combination of policy and community aspiration as well as the general public to take us on the transition journey to low carbon housing. The CRCLCL’s chairman, Robert Hill, who played a key role during the forum by opening discussion and consolidating key outcomes, said the CRCLCL agrees with ASBEC in that collaboration on research and policy is the key to moving forward to developing partnerships and common vision to progress the low carbon housing agenda. For me, the research the CRCLCL and its partners fund, which is providing the knowledge base for our low carbon housing future, is all important. Funding an extensive portfolio of projects, such as the Adelaide living laboratories and Josh’s House, allows for important data to be collected, which is helping us to move the case for sustainable housing up the chain. Forum MC Josh Byrne, who runs Josh’s House, stressed that given political aspirations from the COP21 Paris Agreement and local goals, a more ambitious target for the housing sector was essential. 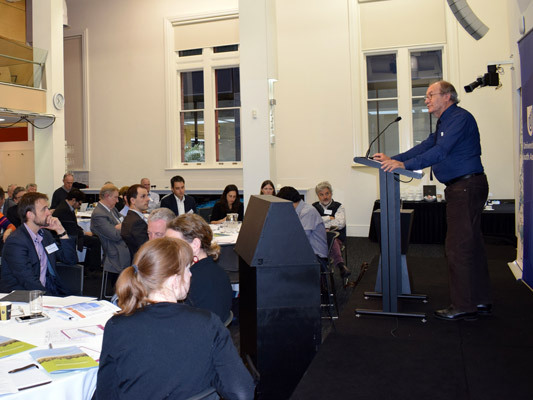 Overall the forum highlighted the fact that we need a nationally consistent, coordinated implementation plan and that all in the room shared the same goal: to work together to fast track what will ultimately be the future in the Australian housing sector – low carbon homes. Professor Deo Prasad is chief executive of the CRC for Low Carbon Living.